Tracking your investments and staying fully invested is easier than ever with the Portfolio Manager on Bondora. The last major update to Portfolio Manager focused on 9 big feature improvements that provide many benefits. Two of these benefits are creating your own custom settings for your portfolio to cover the criteria most important to you and 9 total investment strategies to choose from for portfolio building based on your own comfort with risks and returns from only 3 choices prior. One of the 9 big feature improvements was the Option to Split Your Investment into smaller bids to make it more liquid. 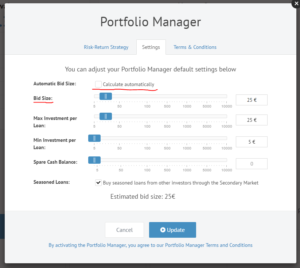 This setting in the Portfolio Manager allows for greater loan diversification by lowering the bid size. You have more money to spread around more loans building a truer p2p loan portfolio. Some loans may be worthy of a 100 Euro investment and other times that same 100 Euro should be split into 4-6 loans. There’s more flexibility by being able to sell off a 25 EUR piece of a 100 EUR loan instead of a 100 EUR loan and more buyers at the 25 EUR level. Selling a 100 EUR investment in 25 EUR parts means more buyers and faster sales than waiting for a single 100 EUR buyer. Bondora has Europe’s largest secondary market for p2p loans and you can enable buying on the secondary market within the Portfolio Manager. You get nearly instant full investment of your Euro and just as nearly instant liquidity for the pieces of loans you want to sell. All at the push of a button. Lenders who enable secondary market buying really love maximizing their investment and keeping as much cash invested as possible. Online investing can lead to cash drag if you aren’t diligent about staying fully invested. There are some lenders who have not taken advantage of the enabled buying or the other customized settings yet. To help those who may want to access this liquidity, Bondora has changed the default setting by setting it at 25 EUR. Now lenders large and small can buy and sell pieces of their loans in their portfolio. If you have set your bid size already then this improvement doesn’t affect you. Your settings are still intact. If you have not set a bid size then the new 25 EUR default will apply to you. The 25 EUR default bid size creates more chances for large and small investors to buy and sell pieces of their Bondora investments to each other. This equals faster purchases and sales and better liquidity for all. The new default setting benefits all investors as liquidity is like insurance or the police. You don’t know that you need the police or your insurance company or portfolio liquidity until you need it. Bondora is planning ahead for those who may need liquidity later but are not asking for it now by giving the greatest chance to buy or sell pieces of your portfolio with this limit set at 25 EUR. What if I don’t want the 25 EUR bid size? If the 25 EUR max bid is not for you, then it’s a very easy change. 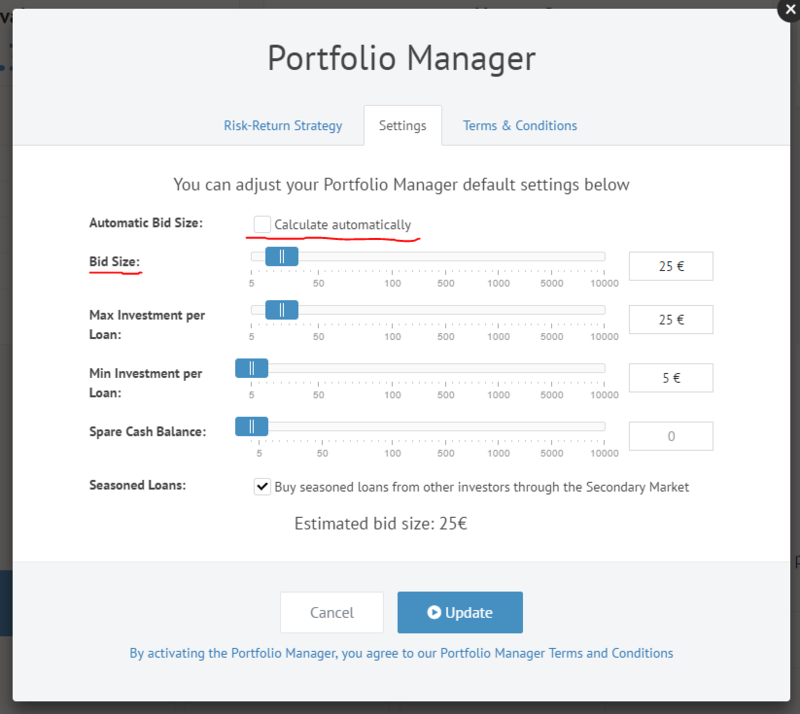 All you do to override the default setting is go into the Portfolio Manager, uncheck the ‘Calculate Automatically’ field and changing the Bid Size settings to the setting you prefer. We are continually working to make the Portfolio Manager as effective as possible for all lenders on our platform. Getting more cash invested faster to reduce cash drag and more liquidity for purchases and sales on the secondary market is good for everyone. That’s what this new default bid size will bring. What improvements would you like to see on the platform? How do you like this new default feature?